Unfortunately, bluestone sidewalks are often seen as a liability to towns and cities. They are harder to maintain and are more subject to unevenness from frost heaves than a replacement like concrete. 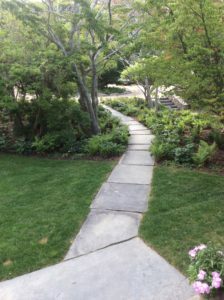 Fortunately, reclaimed bluestone makes for beautiful walkway and patio stones. 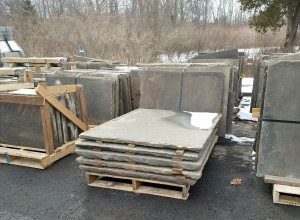 We just harvested 3 truckloads of beautiful antique bluestone in great sizes! 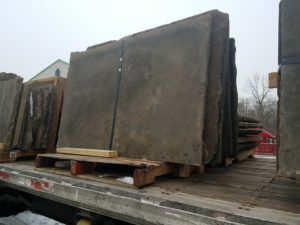 Our first truck just arrived at our yard in Monroe, CT.
As you can see from the recent project below (by Brack Enterprises), reclaimed bluestone is an excellent accent to projects in your outdoor living space. 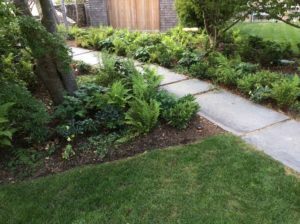 From patios to pathways, reclaimed bluestone is a material landscape architects and homeowners have come to love. Grab a piece of history for your next project!